Engamer is a two column blogger template with sidebar to its right and post section to left.The theme is designed by web2feel and converted by me to blogger.The design is gorgeous and it looks damn proffessional.Top menu links are ready for you.Seo for title has been done and it supports all blog features and is compatible with all browsers.The theme is for gaming template or you would have played the battle games for sure one of my favourites in childhood.There are two menu widgets for you.One is linklist and other is page widget you can add links from your layout.I hope you will like his template for sure. Other blogger templates you may like are Marioland and BrandNew Folio. 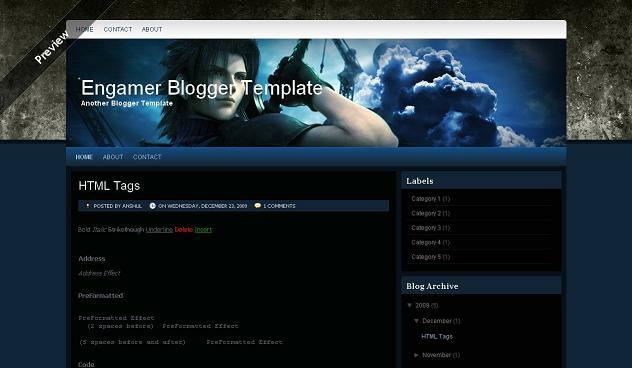 Excellent blogger template. So nice and clean work I really like it. Thanks for nice shearing. A great site. what a change for the better. Keep up the great work. I check it regularly and I really like your new format. Thanks With Best Regards. I'm having trouble changing the header image. I uploaded my own header and changed the link but the image I'm using isn't filling out the space. The image is the exact same size as the source image and I didn't change anything else. Any help? @jerry First have an image of size exact 1,000px Ã— 217px and then just upload it to any image hosting or do it to blogger only and get its link. and replace with yours link. The image I'm using is the exact same size so that's why I'm not understanding why it won't fill out the entire space. First thing I did was find that source image and see what size it was then make something the exact same size. @jerry if you hosted to blogger in image link you would see s400 just make s1600 may be that can be reason i guess. Ok I had the image hosted on photobucket and that seems to be what was causing the problem. I just uploaded it to my own server and it works fine now. I just didn't want it sucking up any of my bandwidth even though it won't be much every little bit counts. 😀 Bizarre problem. And thanks for the theme I think it looks amazing! @insanus just go to blogger Posting > Edit Pages > New page and just do post in it as you do normally .It will be page then. Thx for all, and its a nice template. Thx for shearing. @admin i am not able to see any problem as u said and the template on blogpot is made by me and it has no problem and very bad thing u not using my credits to template. Hi Anshul, Thanks for the quick reply. Sorry abt the credit.. Added it back… I was editing a few things yesterday so i managed to fix the white, black issue.. but if u notice its back again.. I can fix that now. Now comes an other issue. When I add widgets on the footer they come up on the home page. Is there any way to hide them?. Can u help me fix that please.. Thanks bro! @admin if you saying u want that widget to show it up only on post page not home page then do one thing place the codes of that widget in between below two lines it will be solved. Issue Resolved. Thanks a lot again!! Hi Anshul! I am back. 😀 I wanted to add a new menu bar below the existing one but I am unable to do so. Could you please tell me which code I need to edit? @admin there are already two menu bars already in template. Hi Anshul! I realize that, but is it possible for me to create an other one below the 2nd menu bar which will make navigation lot easier and increase available option. Plz help!